Completion of this activity in its entirety will satisfy ABAI's MOC Patient Safety requirement and you will earn MOC Self-Assessment credits. You can earn up to 11 AMA PRA Category 1 Credit(s)™. This self-assessment module is designed to help practicing allergy/immunology providers obtain new knowledge, as well as reaffirm existing knowledge. It also helps allergists/immunologists evaluate and maintain their clinical competence. The module consists of 30 case-based, multiple-choice questions. Comprehensive discussions provide evidence-based explanations regarding all answer options, as well as provides supporting references from the current literature. The questions address four areas of safe steroid use, including: Optimal Dosing, Side Effects--Prevention and Treatment, Adverse Reactions, and Patient Management. There are 4 modes within this module: Pretest, Learn, Posttest and Comparison. Pretest: This initial self-audit allows for one to identify their gaps in knowledge related to the safe use of steroids. Answer each question once and receive a Pretest Score at the end. Learn: This study mode allows one to answer questions, review evidence-based discussions, and link to PubMed abstracts of the references. Answer each question until the correct answer is chosen, then read the discussion and view the references. If you answer incorrectly, you will be given a brief statement on why that answer choice is incorrect. The comprehensive discussion includes rationale for all answer options, whether they are correct or incorrect. Posttest: This final audit allows one to measure the amount of learning that has occurred. Answer each question once and receive a Posttest Score at the end. One has 3 attempts to achieve a passing score of 80% or better. Comparison: This final mode provides a comparison chart showing one’s pretest vs posttest scores, and a peer-to-peer comparison that shows how one compares to their colleagues answering the same questions. The American College of Allergy, Asthma & Immunology (ACAAI) designates this enduring material for a maximum of 11 AMA PRA Category 1 Credit(s)™. Physicians should claim only the credit commensurate with the extent of their participation in the activity. 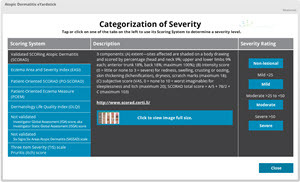 The module satisfies the American Board of Allergy & Immunology (ABAI) Patient Safety requirement. ABAI designates this enduring materials for 11 ABAI MOC Part II (Self-Assessment) credits. After completing this module, participants will be able to experience improved confidence and expertise in their daily practice of prescribing and using corticosteroids to their adult and pediatric patients with asthma, allergic rhinoconjunctivitis, and atopic dermatitis. Severe Asthma: Where Do We Stand? As required by the Accreditation Council for Continuing Medical Education (ACCME) and in accordance with the American College of Allergy, Asthma and Immunology (ACAAI) policy, all educational planners, presenters, instructors, moderators, authors, reviewers, and other individuals in a position to control or influence the content of an activity must disclose all relevant financial relationships with any commercial interest that have occurred within the past 12 months. The ACCME defines a “commercial interest” as any entity producing, marketing, re-selling, or distributing health care goods or services, used on, or consumed by, patients. The ACCME does not consider providers of clinical service directly to patients to be commercial interests. For more information, visit www.accme.org. All identified conflicts of interest must be resolved and the educational content thoroughly vetted for fair balance, scientific objectivity, and appropriateness of patient care recommendations. It is required that disclosure be provided to the learners prior to the start of the activity. Ana D. Broyles, MD, Editor-in-Chief, Planner, Author, is Assistant Professor of Pediatrics, Harvard Medical School, Director, Drug Allergy and Desensitization Program, Division Of Allergy/Immunology at Boston Children's Hospital. She is the principal investigator of several innovative clinical research projects related to drug allergy and food allergy. She is one of the Chief Editors of a major ongoing project: Guidelines for the Management of Drug Hypersensitivity Reactions, sponsored by the AAAAI. In addition, as a member of Harvard Medical School Academy and her role as Allergy/Immunology Resident Rotation Director at Boston Children's Hospital, she is very involved in teaching and education. Mary B. Hudelson, MD, Advisor is the owner/director of Family Allergy and Asthma CARE and the Food Allergy Institute of North Texas located in Flower Mound and Denton Texas. She is board certified in allergy and immunology and is an active member in the ACAAI and AAAAI. Beena Rao, MA, Managing Editor, has been working as an editorial consultant for 20+ years. She has more than 10 years of experience as editor and project manager of self-assessment programs for various medical specialist societies. Her experience also includes editing and project management for medical and scientific books, journals, monographs, policy papers, and meeting abstracts. Jonathan A. Bernstein, MD, Author, is Professor of Clinical Medicine in the Department of Internal Medicine, Division of Immunology/Allergy Section at the University of Cincinnati Medical Center and Director of the Clinical Research Unit at the Veterans Hospital and Allergy Section of the Division of Immunology. He is a partner of the Bernstein Allergy Group and Clinical Research Center. His current research involves the health effects of UV irradiation units as an environmental intervention installed in the homes of asthmatic children funded by NIAID, angioedema/chronic urticaria, biomarkers for Trimellitic anhydride sensitization in the workplace, allergenicity of cyanobacteria, phenotyping chronic rhinitis subtypes specifically non-allergic rhinitis and seminal plasma hypersensitivity. Joel S. Klein, MD, Author, has practiced in the north suburban Chicago area for over 20 years since completing his Allergy/Immunology fellowship at Mayo Clinic (1992-1995). He is a past president of the Illinois Society of Allergy, Asthma and Immunology (2001-2002) and served in the society's honorary position of Historian for 10 years (2005-2015). He has had an academic appointment as Assistant Clinical Professor of Medicine at Rush University Medical Center and has given a monthly lecture to interns and residents at Skokie Hospital since 1997. Travis A. Miller, MD, Author, is in private practice as the Medical Director of The Allergy Station at SACENT in Roseville, California. He specializes in treating allergic, respiratory and immunologic conditions in children and adults. He is affiliated with Sutter Memorial Hospital, Sutter Roseville Medical Center and Dignity Health System. Dr. Miller teaches medical residents, medical students, physician assistants, nurse practitioners and nursing students in his office. Anil Nanda, MD, Author, has been in practice in Texas for the past 12 years. He has an academic appointment as a Clinical Assistant Professor of Medicine in the Division of Allergy and Immunology at the University of Texas Southwestern Medical Center in Dallas, Texas, where he has been involved in the training of Allergy/Immunology fellows, internal medicine residents, and medical students for the past 12 years. Marissa R. Shams, MD, Author, joined the Allergy/Immunology practice at The Emory Clinic/Emory University in 2014. She currently sits on the Advocacy Council of the American College of Allergy, Asthma & Immunology, and the Executive Board of Allergists for Israel. She has presented her research projects on the state, regional and national level and has conducted interviews with both CBS radio and the NBC Today Show. Anita Wasan, MD, Author, is a board-certified allergist and immunologist. She has been practicing in the northern Virginia area for over 12 years. She is an active member in various committees with the American College of Allergy, Asthma & Immunology.